When it comes to spending habits, Americans lavish money on their pets, spending $45.5 billion in 2009, including $3.36 billion on pet services, according to the American Pet Products Association, in Greenwich, Conn.
As a result, pet jobs for animal care and service workers are expected to outpace jobs in other sectors and grow by 21 percent from 2008 to 2018, according to the Bureau of Labor Statistics. For those who love animals and want to cash in on caring for the cute and cuddly, here are some in-demand, pet jobs. Most don't require formal job training and allow you to set your own hours and work schedule. These pet jobs also offer low-cost points of entry. The one downside for all: Work-related injuries and illness for animal care workers is higher than the national average, reports the Bureau of Labor Statistics. 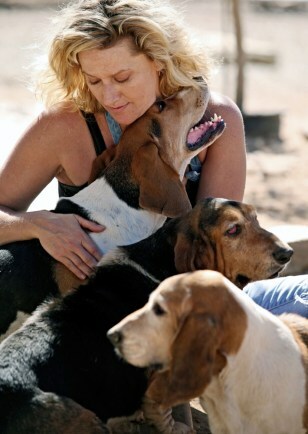 Pet sitting is just one of the five great pet jobs for animal lovers. Professional pet sitters care for pets in the pets' own homes, giving them water, food, and attention once or twice daily for about an hour at a time while their owners are away. Some sitters even provide overnight stays. 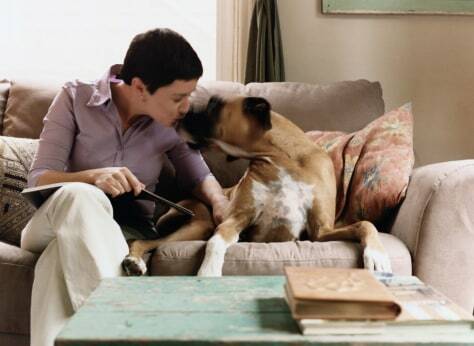 Pet sitters usually charge hourly per-visit fees. Holidays and summer months are the busiest seasons, with early morning and late evening hours typical for these pet jobs, says Ali O'Connor, a pet sitter and owner of Inko's Exemplary Pet Care Services in Naples, Fla. O'Connor charges $35 per hour and more for pets who have special needs and sits for five to 25 pets per week. After barely breaking even her first two years, O'Connor made $32,000 last year working "full throttle." Because you are entering someone's home and are responsible for the pet 24/7 while owners are away, O'Connor strongly recommends pet-sitting insurance and bonding. Others costs include a reliable car, gas, pet treats and toys. The National Association of Professional Pet Sitters in Mt. Laurel, N.J., offers a certification program that includes pet handling, business skills and first aid for these pet jobs. Dog walker Morgan Tubman walks dogs with the Golden Gate Bridge in the background in San Francisco. 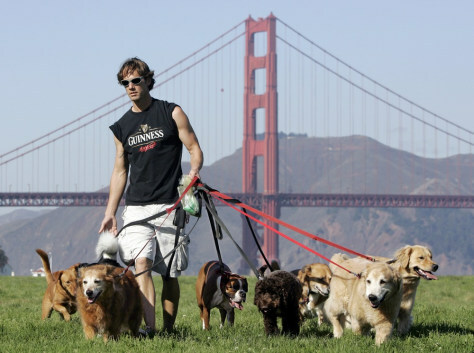 Dog walkers typically work — and walk — six to eight hours per day, with one or more dogs. Some also offer obedience training. All walkers pick up poop en route. Dog walkers earn $30,000 to six-figure annual incomes in these pet jobs, with averages around $40,000 to $60,000, estimates Veronica Boutelle, founder of DogTec.org, which offers several resources in running dog-related businesses. Dog walkers charge an average hourly fee from $15 to $25, depending on whether the dog is walked in a pack or alone. Startup costs for these pet jobs are extremely low, says Boutelle. It includes "a vehicle, if needed, some marketing, some education," she says. Aside from a business license, some park districts and city governments are beginning to require local permits for dog walkers, Boutelle says. DogTec's four-day Dog Walking Academy and certification program costs $550 and is offered in locations nationwide. DogWalker.com, an online directory of dog walkers around the country, offers educational resources for those starting out. 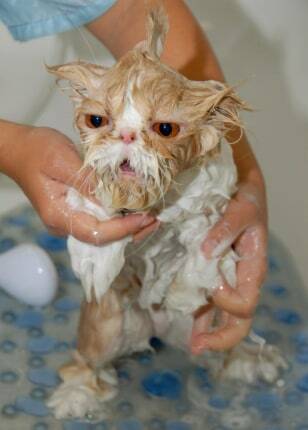 Oliver, a two-year-old Persian cat, gets her monthly shower at a pet groomers. Groomers get Fido and Fifi looking dapper (yes, there are cat groomers, too) through combing, bathing, nail-cutting and shearing. Pay is $75,000 to $100,000 per year, estimates Debra Kusch of Kusch's Canine Cleaners in Aloha, Ore. Kusch charges on the low end, from $25 to $30 per hour and grooms eight to 10 dogs per day, five days a week. To see if you want to become a self-employed groomer, Kusch suggests working for someone else first in pet jobs such as bathers or combers. Groomers operate out of their own home, a shop or a mobile grooming van. Costs for basic grooming supplies and home modifications, such as pet tubs and crate dryers, are minimal, Kusch says. Starting your own shop costs $50,000 to $150,000 in major cities, according to online resource PetGroomer.com. Wag'n Tails Mobile Pet Grooming Conversions Inc., in Granger, Ind., offers basic trailers starting at $32,180 and its Pet Stylist Elite van for $83,192. The National Dog Groomers Association of America Inc. in Clark, Pa., offers educational programs. It may not sound pleasant, but it's worth holding your nose to be a professional pooper scooper, picking up pooch potty in the backyard. There are an estimated 800 professional scoopers nationwide, according to Tim Stone, founder of the Association of Professional Animal Waste Specialists in Santa Clarita, Calif., many who earn up to $100,000 per year in these pet jobs. Most charge about $45 per month for a once-weekly cleanup. Stone, who has operated Scoop Masters in Santa Clarita for 22 years, spends less than five minutes at each clean-up site and works about 25 hours a week. A reliable vehicle, a pooper scooper tool for $10 to $45 and some plastic baggies are all you'll need, says Stone. The Association of Professional Animal Waste Specialists offers business resources, including an annual industry conference. Ellen Schreffler massages Taiter at the Chateau Poochie luxury hotel for dogs and cats. Don't view pet massage as a luxury business, say Ali O'Connor, a certified massage therapist and owner of Inko's Exemplary Pet Services in Naples, Fla., says pet massage isn't a luxury service. She works on referral from veterinarians. A pet masseuse helps animals manage chronic pain and aging, and recovery from injury or surgery. "It's actually more of a maintenance and rehabilitative thing for animals," she says. Full-time pet masseuses may net $15,000 to $60,000 per year in these pet jobs, estimates Megan Ayrault, a licensed massage therapist and founder of AllAboutAnimalMassage.com. Hourly fees are comparable to what is charged human clients in the same geographic area, says Ayrault. That amounts to $25 to $150 per hour. O'Connor provides massage therapy for two to five pets per week and charges $45 to $75, depending on how often the pet needs massage and the complexity of the massage. You'll need formal training for these pet jobs; several states regulate the industry through their departments of health. Ayrault estimates educational costs at $900 to $7,000. You'll also need insurance. The International Association of Animal Massage and Bodywork in Toledo, Ohio, maintains a list of state regulations and a list of member schools.